After graduation, Osoro didn't wait for employment to come along. He used his savings to buy some basic equipment, rent a place, and start his own clinic. Photos by Tervil Okoko for IntraHealth International. The Afya Elimu Fund is a public-private partnership established by IntraHealth International’s FUNZOKenya project (and subsequently led by IntraHealth’s Human Resources for Health Kenya (HRH Kenya) Mechanism), in partnership with the Higher Education Loans Board, the Ministry of Health, and the Kenya Healthcare Federation. Both FUNZOKenya and HRH Kenya are funded by the US Agency for International Development. 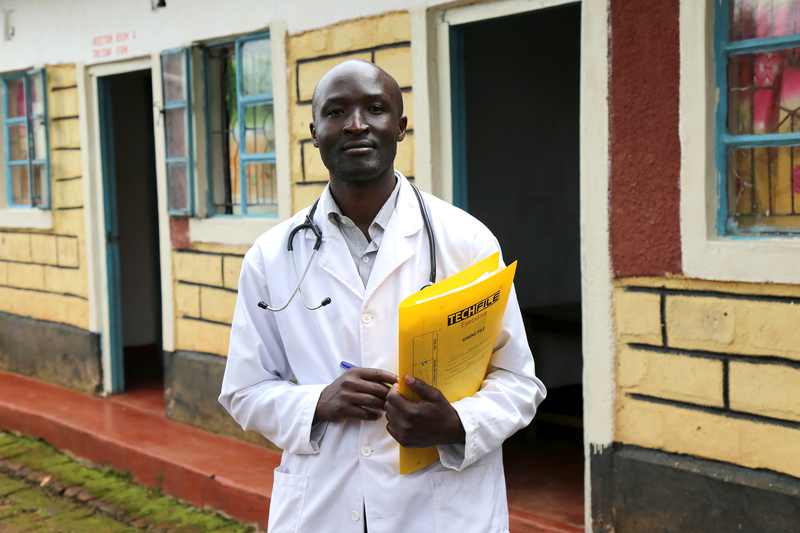 Osoro works with a client in his clinic in rural Kenya. Photo by Tervil Okoko for IntraHealth International.